Crossing the border from Belize into Guatemala was simple! The border is barely 20 minutes from the hotel, and we were offloaded on the Belize side, went through Immigration, paid our $20 and met up with our Guatemala guide, Mariella, on the other side and climbed into her brand new van for the 2 hour drive to Tikal. Just 24 years old, her whole family is in the tourism industry and she has the canned history and geography down pat. The countryside is beautiful, with huge vistas, lakes, small villages - and rough roads! 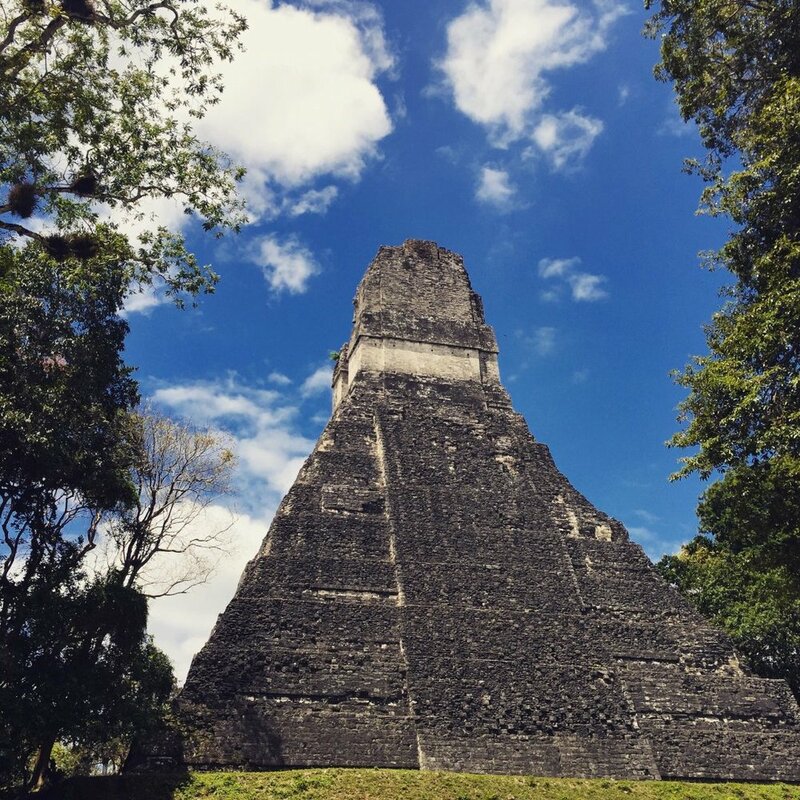 [su_pullquote]There are really no words to describe this place, this sacred area of Maya history, and photos don't do it justice. It is definitely one of those places that you have to see and experience for yourself. [/su_pullquote]The Tikal National Park is a designated World Heritage Site. Spending just a short day there is not enough, just enough to whet the appetite for more. The day tour just touches on the most important areas, but I would like to discover some of the lesser-known parts. Also, it was extremely hot and Mariella (despite her size) kept up a grueling pace that nearly got the better of me. Fortunately, Jane noticed I was looking overheated and so I downed a very cold Belikin beer, which cooled me down and I was able to continue! It's a very physical tour, with lots of walking and climbing stairs and pyramids. We could actually climb some of the temples' rock stairs While others had wooden stair cases built to keep people off the ruins. But it makes you wonder how the Mayas, who generally appear to be quite short, were able to regularly go up and down these towering edifices with steps that seem to be twice a normal (or modern) height! Once in a day is more than enough for me. Some of the viewing platforms, especially on Temple lV (I think) are very high and un-fenced, just a few feet wide. People and their children were nonchalantly walking back and forth and I was cowering, back against the main wall, with very wobbly knees! Me and heights don't get along! Mariella told us which temple was which but I probably have not identified them correctly in the photos! Gives me a reason to go back to explore at a slower pace and also time to read up on it more. The day we went was during Easter week, right around the spring equinox, so there were a lot of people visiting. Tourists, but also a lot of local people; whole families with grannies and infants, the men carrying coolers and women with hampers who set up picnic spots under the trees to spend the day in this very sacred spot. On our long walk out of the park, we saw coatimundi rummaging around on the forest floor, heard the howler monkeys and saw spider monkeys swinging through the branches. At the lunch restaurant on the outskirts of the park, there was great excitement when toucans were sighted outside! I was so tired at that point, I really didn't care but got a shot (that if you look closely) of the colorful bird! The ride home to Maya Mountain Lodge was a lot quieter than our inbound trip. I was thinking about the long flight the next day, looking forward to seeing Ryan, but dreading being back in Washington. Hanging on to memories!